Jean-Paul Buongiorno was born into an Italian-French family. His musical training began with classical piano at an early age. He later taught himself electric guitar in high school by listening to the blues guitar playing of B.B King, Muddy Waters, Stevie Ray Vaughn, Jimi Hendrix and many others. Later, while attending Art School at the University of Wisconsin-Madison, he became influenced by Jazz, Brazilian, and world musicians such as Django Reinhardt, Wes Montgomery, Paco de Lucia,Tom Jobim, Baden Powell, Joao Gilberto, Gilberto Gil, Caetano Veloso, Bob Marley, and many more. Jean-Pauls passion for music has led him through many genres including blues, funk, reggae, Cuban, Brazilian, and flamenco all of which are reflected in his unique personal style of playing as well as in his compositions. He has lived and performed in Brazil, Spain and the U.S absorbing the music of each country. Jean-paul has studied with jazz guitarist Mimi Fox, flamenco guitarists Jason Mcguire and Juan del Gastor, Brazilian guitarist Paolo Bellinati, and many others. 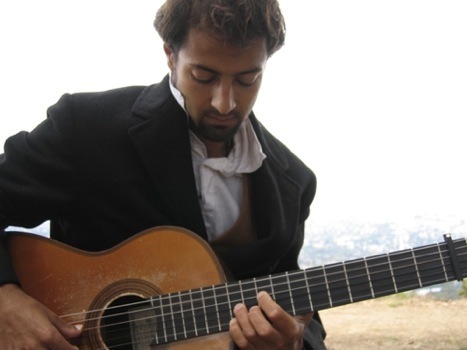 Jean-paul currently lives in Berkeley California where he continues to perform, compose and teach.